Reader Chris71 has discovered the smoking gun on the NSIDC web site. Read on. 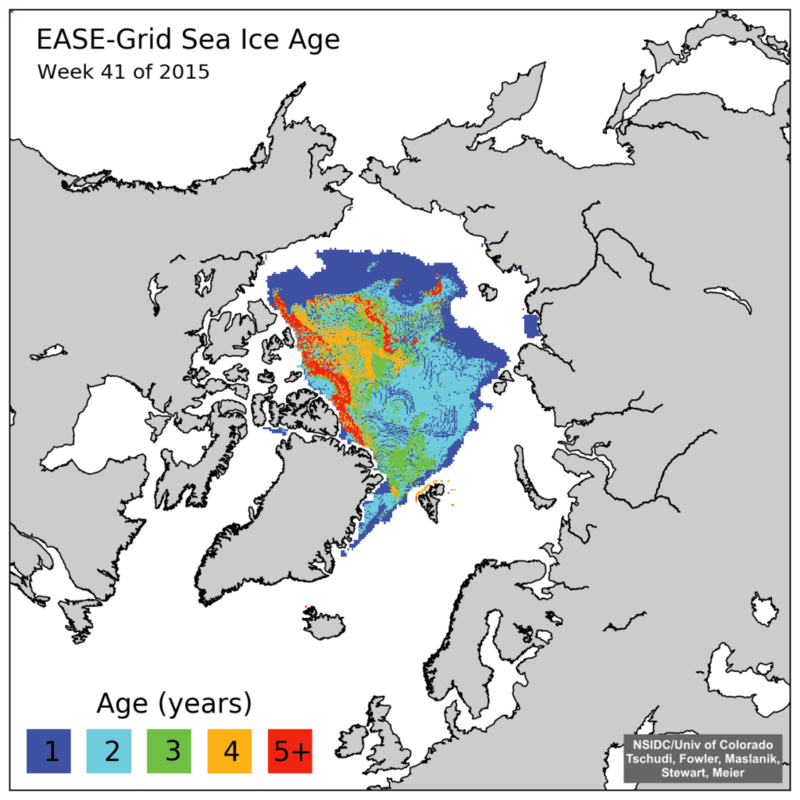 A few weeks ago, NSIDC put out this press release, claiming that 5+ year old ice is at its smallest level on record. The press release included the map below. This is a new style map which they just started in week 39 2015. The map below is for week 41 2015. All of their previous 1984-2015 maps have been deleted from their archive. The good news is that Chris found one of their old style maps which had not been scrubbed from their website. NSIDC has deleted the original graphs, but seem to have forgotten to get rid of the copy. Here are some graphs from the Arctic – automatically saved here, and some of them archived Enjoy! Fred aka DungeonMaster on http://forum.arctic-sea-ice.net/. Version 3 – February 2016. Daily Polar Gridded Brightness Temperatures Data Set, NSIDC-0001. Used Ice concentration estimates greater than 15 percent from the Sea Ice Concentrations from Nimbus-7 SMMR and DMSP SSM/I-SSMIS Passive Microwave Data Set, NSIDC-0051, to indicate where ice extent is present. The sea ice age data in these files are derived using data from satellite passive microwave instruments, drifting buoys, and a weather model. With these data sources, the formation, movement, and disappearance of sea ice can be observed; and these observations can, in turn, be used to estimate ice age (Maslanik et al. 2007). The ice age data are derived from a number of passive microwave imagers: the Scanning Multichannel Microwave Radiometer (SMMR), the Special Sensor Microwave/Imager (SSM/I), and the Special Sensor Microwave Imager Sounder (SSMIS). Visible and infrared data from the Advanced Very High Resolution Radiometer (AVHRR) were also utilized through 2004. In addition, International Arctic Buoy Program (IABP) drifting-buoy vectors and the National Centers for Environmental Prediction (NCEP)/National Center for Atmospheric Research (NCAR) Reanalysis Project (CDAS) are used to augment the satellite data (Tschudi 2010). Version 3 – April 2016. So there you have it “Steve”. Thanks to the sterling (albeit uncredited!) efforts of the all volunteer members of the Arctic Sea Ice Forum and the (presumably still paid?) scientists at the National Snow and Ice Data Center you can now explain the truth, the whole truth, and nothing but the truth of the matter to your own loyal readers. Can you spot the difference Tony? In partial answer to a question posed below, here’s an animation of Arctic sea ice age from September 2010 to May 2015. Can you see what has happened to the old ice Tony? Original Arctic sea ice age images from: Tschudi, M., C. Fowler, J. Maslanik, J. S. Stewart, and W. Meier. 2016. EASE-Grid Sea Ice Age, Boulder, Colorado USA: NASA National Snow and Ice Data Center Distributed Active Archive Center. http://dx.doi.org/10.5067/PFSVFZA9Y85G. Looks like we won’t have “Steve Goddard” to kick around anymore… Heller has decided to now troll the internet using his real name. When will Willard Watts emulate Heller and start to post using his actual name? Is Goddard/Heller paid to be a pathological liar? But I have to give it to him. He’s creative when it comes to making up this nonsense. His henchmen then try their best to spread the poison. The “rebloggers, retweeters, plagiarisers and other assorted acolytes” have been comparatively quiet on this one. “Caleb” has regurgitated Heller’s bilge verbatim, and advertised the fact at WUWT. Needless to say my corrective comment is currently invisible at the home of “Truth, beauty and laughter”. Drifting buoys cannot measure the age or thickness of anything more than local , probably 1st year, sea ice, because they are floating devices.. I wonder why you bother interacting with the clowns in comment threads there. Surely, just pointing out Heller’s follies would do. 3. I’m happy to labour the point that “Steve”/Tony pulls his conspiracy stories out of thin air having done zero due diligence and then remains conspicuously absent when called upon to justify them. Despite having had a chance to read my learned commentary on Mr. Heller’s article Mr. Homewood nonetheless regurgitates the bilge, still without giving the Arctic Sea Ice Forum credit for their sterling efforts on behalf of Arctic sea ice afficionados everywhere. Needless to say my attempt to bring this unfortunate oversight to Mr. Homewood’s attention is currently invisible. 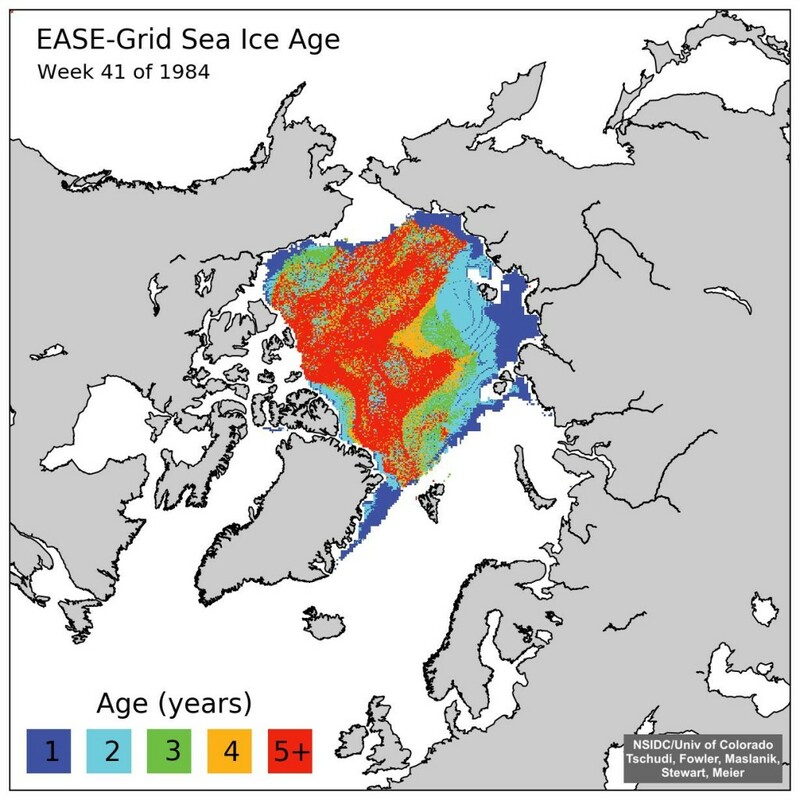 Notwithstanding Al Gore’s predictions that the Arctic ice cap had a 75% chance of disappearing in the summertime of 2014, the sea ice is still there. This blog made a false allegation that Roger Harrabin has financial links with extreme green groups. This allegation was first made in the Mail on Sunday, who were forced to withdraw it after a legal challenge from Mr Harrabin. We accept that the allegation is damaging and untrue, and therefore libellous. We apologise and have withdrawn the comment. One cannot help but wonder if Mr. Homewood will now also withdraw his recent scurrilous allegations against the National Snow and Ice Data Center? And the Danish Meteorological Institute? And the National Aeronautics and Space Administration? Where the alarmists have for years been doomily predicting ice free summers in the Arctic – according to Al Gore in 2007, 2008 and 2009 it would be gone by 2013 – the truth is that multi-year ice has been staging a recovery since 2009. That Delingpole has blogged about it is really all the proof I need that it is untrue. I had mistakenly assumed that if a certain spot is iced over continuously for 5 years, that a priori, that certain spot contains 5 year ice. But in actuality, ice at that spot might be 2 year ice which has drifted in from elsewhere, and the 5 year ice which used to be there has drifted away. And I have to assume since that 5 year ice is no longer on the map, it must have drifted to a warmer place and melted completely away. (It can’t morph into 2 year ice, for instance.) Or perhaps it is jammed up tightly against other 5 year ice. So the age of ice at a certain location is determined by such things as imaging, brightness and thickness, and buoy motion vectors to determine where the ice originated. It has nothing to do with how long ice has been continuously present at a certain place. I’m hoping you understand this better than I do, because I have another question. Why would they have to eliminate unrealistic buoy velocities? Their buoys either left one place and got to another place or they didn’t. It identifies the “fast ice” around the shores of the Arctic Ocean that has remained in place over the winter. All the rest moves under the influence of winds and currents. As the “freezing season” starts newly formed “first year ice” is identified from satellite data and then tracked as it “drifts” around the Arctic Ocean. If it’s fortunate enough enough not to “melt completely away” the next summer it becomes “second year ice” and so on. I’ve added an animation of sea ice age to the article above. Watch what happens at round about week 38 each year. Geez. Cannot help but note that “fast ice” is a crappy nom de science for something that is fixed in place. Thanks for your work, Jim. Just one of the vagaries of the English language? Stuck fast as opposed to moving fast! The term comes from “ice that is FASTened in place”, but the more commonly used meaning of “FAST” is fast becoming more apt. The roots of the term “fast ice” may also have some involvement with the concept of an object being “stuck fast”. As you so enjoy your little jousting matches with “Malice in Blunderland”, I have emailed a few snippets that you may enjoy. Feel free to use whenever any appropriate moments occur. P.S. It’s now just under 20 hours until the re-scheduled eye operation. Hopefully I’ll soon have two working eyes again, and be able to see an Excel spreadsheet once more. Watt’s snipped his former moderator Smokey and tossed Goddard under the bus. I haven’t seen you online for a while and hope that you are not having health issues. Here’s something that may put a smile on your face. Check out the links on Reggie’s comments at the bottom of the thread. No health problems here Lawrence, although the same cannot be said for the Arctic.